Trend-setters and renegades: welcome to your metaphorical treasure trove. Titanium Jewelry always keeps a close eye on the latest trends to help you find cutting-edge styles to suit your particular style profile. Whether you're into super skinny stacking rings or chunky, industrial-inspired tungsten rings, Titanium Jewelry is on hand to help you find a great look. This selection of trending jewelry is packed with trendy rings, bracelets, necklaces, gifts and much more. Click to Read More. Follow our social profiles for the latest updates! These are the top trending jewelry pieces from our social media channels, so they've already gained plenty of traction among jewelry-lovers. If you're looking for a style that'll go viral, be sure to make our trending jewelry section your go-to source for cutting-edge jewelry and accessories. 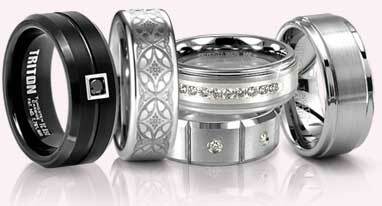 You'll find unique men's wedding rings, bold pearl bracelets and other pieces inspired by the hottest jewelry trends. Remember, you always get a lifetime guarantee when you shop Titanium Jewelry.